Most Coloradans consider “hiking season” to be June through September, but such a viewpoint is severely restrictive. The fall, winter and spring months are often the most rewarding times of year in the high country. There’s nothing quite like having a popular destination such as Quandary Peak or Dream Lake to yourself, soaking in a sea of white-capped mountains as you sip hot tea in the quiet, peaceful solitude. Like many outdoor novices, a few short years ago I viewed the gap between summer and winter hiking as insurmountable. I had too many questions, and the answers were hard to find. The truth is, like many things in life, it’s more difficult in your head than it is in reality. AN INTRODUCTION TO WINTER LAYERING: This was one of the most confusing aspects to me when I was starting out. Hard shell or soft shell? Down or synthetic? How many layers do I need to carry? This stuff isn’t cheap, so making the right choices is crucial. Everyone has their own system. I’ll offer mine as a guide, along with the reasoning and a more general perspective. The best way to figure out your own preferences, however, is through trial and error. Polyester/spandex short-sleeve T-shirt: Avoid anything with cotton. I don’t like long sleeves because they’re uncomfortable when you’re layering on top of other pieces, which are almost all long-sleeved as well. This is merely my own inclination. If you prefer long-sleeve baselayers, by all means, go to town. Fleece 1/4-zip pullover: This is my outer layer most of the time in winter. A simple T-shirt and a fleece gets it done when I’m moving, even in frigid temperatures. It’s surprising how much heat the active human body can produce. The other stuff piles on only on the windiest, coldest days, or when there’s precipitation. Midweight synthetic pullover or vest: Down would be fine here as well, but midlayers are often worn under a shell and can get sweaty when you’re working hard. Synthetic insulation stays warm even when wet. I leave this one behind to save weight when the forecast is warm and dry. Soft shell jacket with hood: Hard shells are fine too, but soft shells are generally more breathable and affordable. A cheap hard shell is about as noisy and comfortable as wearing a garbage bag, and you want to avoid sweating as much as possible in the winter. Soft shells usually hold up just fine in Colorado’s dry snow. If you have the money, in 2018 fabric technology has evolved to the point that top-end hard shells are beginning to rival soft shells for breathability and comfort, while weighing significantly less. A hood is a necessity for blocking wind and snow. Down over-it-all puffy with hood: This is the jacket that will stay at the bottom of your pack 90 percent of the time, but will become your best friend during long rest breaks, on summits or in an emergency situation. Don’t skimp. Buy something you’re absolutely confident can keep you warm even in the nastiest of elements. Again, synthetic works fine, but in general down is lighter and more packable. 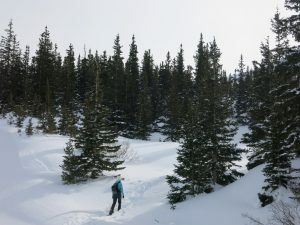 The Colorado Mountain Club’s Avalanche Terrain Avoidance School teaches everything you need to know to hike safely in the winter for a mere $30 ($40 for non-members). True to its title, this course shows students how to recognize dangerous avalanche terrain so they can avoid entering it altogether. It includes a three-hour lecture and a full field day for hands-on learning. 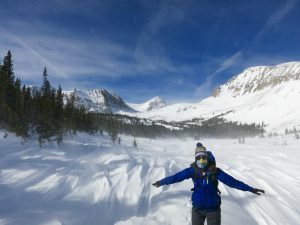 There are also free avalanche awareness seminars offered by many fine organizations throughout the Front Range, but these tend to only be about an hour and cover much less information. 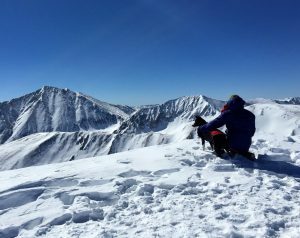 Skiers and mountaineers who willingly choose to enter avalanche terrain should take an official American Institute for Avalanche Research and Education (AIARE) Level 1 course. People often equate winter climbing with ice axes and crampons. Most of the time, that’s simply not true. You’re far more likely to use snowshoes and trekking poles than technical gear. Ascending wind-swept ridgelines keeps you out of avalanche terrain. Just look out for cornices and make sure there’s terra firma under your feet. Snow-climbing season typically begins in April or May, when it’s time to bust out the ice ax and crampons for those tasty couloirs. Trail crampons, plus snowshoes or alpine-touring skis for flotation, are likely all you’ll need for winter backcountry travel in Colorado. No duh, right? It’s shocking how often someone will be stuck four miles from the trailhead with a solid chunk of ice as their water supply. This is easily avoidable. For starters, leave the hydration bladders at home. Yes, even if you have an insulated hose and tuck it into your jacket. That might work most of the time, but it simply won’t on the coldest days. Water freezes in the constrictions and blocks your access. I prefer to keep a Nalgene, turned upside down, in an insulated sleeve clipped to my pack’s hip belt for easy access. My other water bottles are in my pack, wrapped in extra layers and pushed against my back for the additional body heat. A bit of electrolyte powder also protects against freezing. The same goes for food. Energy and candy bars can become inedible concrete in frigid temperatures. Stash these in your pockets and utilize body heat to keep them warm, or carry snacks you know you can chew even in extreme cold. Sure, they’re yellow or orange or some other fancy color, and they make you feel like a real mountaineer. They’re also overkill for winter hikes and surprisingly not all that warm. Run-of-the-mill snow boots are cheaper, lighter, warmer and more comfortable. As long as they’re waterproof, have insulation and come up to your ankle or above, you’re golden. Such boots are even compatible with strap-on crampons. The big caveat is that you’ll want more technical footwear with at least a heel welt, and potentially a toe welt, if you plan to climb steep snow or ice using hybrid or pro-style crampons. The 10 Essentials list is even more important in winter, when the stakes are higher. I’d like to add four more: a thermos, a multiclava, goggles and mittens. The thermos might be a luxury, but there’s nothing better than hot soup, coffee, hot chocolate or tea on a cold, windy day. I often joke that a thermos is the best gear purchase I’ve ever made. A multiclava is a close runner-up. These little pieces of fabric have myriad uses, including as a facemask. You have to be able to cover every inch of exposed skin in the winter to prevent frostnip or frostbite. That’s where the goggles come in, too. You need to see even if it’s windy and dumping snow. Finally, buy a good pair of mittens. Even the nicest gloves can’t compare to mittens for warmth. Keeping your extremities comfortable is one of the most difficult aspects of winter hiking. It’s not uncommon to carry three pairs of handwear — fleece liners, waterproof ski gloves and heavy mittens — and adjust hour by hour. OK, not really. The warmth of the sun feels pretty damn good in the winter. It’s just doubly important to have proper sunglasses and apply SPF30+ sunscreen every two hours. The sun reflecting off the snow is lethal, and if you don’t take the steps to protect yourself, you’re in for a world of pain. I’m speaking from experience. Pack sunglasses that cover your full field of vision. Glacier glasses are best, and they’re really not that expensive. Keep sunscreen easily accessible, such as in your pants pocket, to limit the excuses against applying it regularly. Snowblindness is not fun. Trust me. Like a layering system, this will vary depending on a person’s itinerary, risk tolerance, attitude and experience. The key is being confident in your ability to survive until help can reach you or you can extricate yourself. For some that means a tent and a sleeping bag, for others a bivy sack, and for still others simply extra layers. The margin for error is much smaller in the winter than it is in the summer. This is also where that big down puffy you splurged on can come in handy. I haven’t touched on navigation, largely because it’s too important of a subject to cover in a short blog post. Summer trails are covered by snow and difficult to follow. 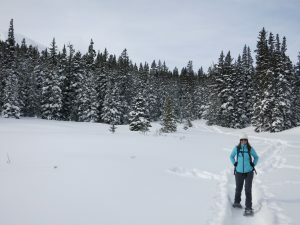 You need to know how to get around using local familiarity, common sense, GPS or good old-fashioned map-and-compass skills.Popular areas often have trail markers or enough traffic for a more-or-less permanent track through the snow. 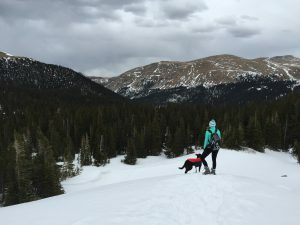 These destinations are bountiful throughout the Front Range, including St. Mary’s Glacier, Rocky Mountain National Park, Brainard Lake, Moffat Tunnel, Echo Lake and many others. Such routes also tend to be shorter and flatter, the perfect place to build confidence and dial in your personal layering system. Jeff Golden is a freelance writer based in west Denver. He’s a Colorado Mountain Club trip leader and volunteer with a mountaineering resume that includes all 58 of Colorado’s 14ers, Mt. Rainier, Mt. Hood, Gannett Peak and El Pico de Orizaba. You can follow his better half on Instagram at @climbingcollie.